I am delighted to be able to share with you the totals of our main fundraising efforts this term. Thank you everyone for the generosity shown to help those in need, reaching a grand total of £1059.64. On Tuesday 4th December, the whole school walked to the Church of the Sacred Heart and St Peter the Apostle for our annual Advent Service. This was a wonderful opportunity to reflect at the very start of the season of Advent the awe and wonder contained within the Christmas story. Children from every year group took part in leading the service, and the singing of traditional and modern hymns was rousing and uplifting. Thank you to Fr Jeremy and all who work in the parish for hosting us so warmly, and to the many family volunteers who accompanied the children on foot. On Wednesday the entire Reception year took to the stage to perform their Nativity play. 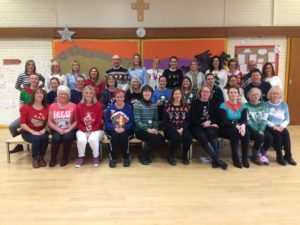 The Early Years team chose to produce a traditional Nativity play, like the one that you and me had when we were at school! It was a true delight to see children who have been at St Peter’s for only 3 months singing, acting and narrating with such confidence and enjoyment. Great thanks go to all the families who helped the children prepare for the performance, and of course to the wonderful Early Years staff who made it all happen. And of course, very well done indeed to the Year R pupils. In this coming week ahead, everyone in the St Peter’s community is warmly invited to the Key Stage 2 Carol Service at the Church of The Sacred Heart and St Peter the Apostle on Wednesday 12th December 2018. The Carol Service begins at 6:00pm and will last for approximately 1 hour. We look forward to welcoming as many of you there as we can. Families are asked, where possible, to make use of local car parks in Waterlooville to ease the burden of traffic around the church. Although the church has a large car park, the more people that are able to park away from the church and make a short walk the better as this is a very popular event. Possible car parks to use include the free parking at Asda or the Wellington Retail Park by Sainsbury’s; the Waitrose car park is also nearby but does make a charge before 6:00pm. Please do not park in the residential roads immediately around the church, as local homeowners will need access to their own properties and parking at the end of the working day.